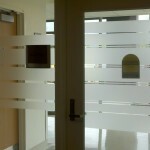 One aspect of patient privacy is regarding visual privacy; whether that be patient�documents or exam rooms and hallways. We have been able to assist in many projects to help hospitals and contractors provide this privacy in order to comply with regulations. 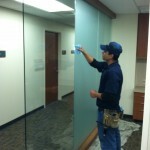 Larson Glass has quite a bit of play in a variety of projects ranging from hospitals, schools, county and state buildings. 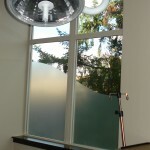 They installed some large glass panels in a Multi-care location, and after installation, were notified this glass needed to be frosted due to its location in the building. They called us up to see how we could help them out. 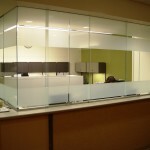 For many years we have used 3M Dusted Crystal�on these types of jobs and knew it would work great here. As you can see the panels are pretty large and in order to provide complete privacy full coverage was necessary.